The virus, spread by wind-blown mites about half the length of a grain of salt, has been found in at least 30 states . In Texas, the Fort Worth Botanic Garden had to replace its entire rose collection. The virus recently was found to have spread in northwest Louisiana, including the home city of the American Rose Society and its gardens — the largest U.S. park devoted to the national flower. Rose rosette has been known since the early 1940s — and was once hailed as a possible way to eradicate an invasive plant . The center’s 40 acres (16.2 hectares) with rose gardens are free of the disease so far, said the society’s executive director, Laura Seabaugh. That can mean hard choices, said Dr. Mark T. Windham, who’s testing plants at the University of Tennessee-Knoxville to find resistant varieties. “I’ve had people tell me, ‘The bush that has it, it’s the only surviving clone of my great-grandmother’s rose.’ I hate to say it, but are you going to try to save that rose and put your 500-bush rose garden in jeopardy?” he said. The Fort Worth Botanic Garden uprooted about 2,000 bushes in 2015, rosarian Jeffrey Myers said. 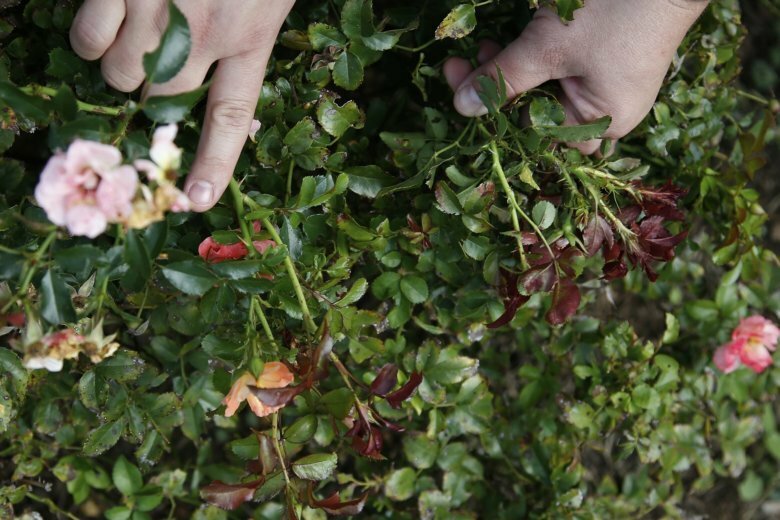 He said their close-set rows let mites “crawl through like a highway from rose to rose.” The botanic garden now has about 350 rose bushes, set at least 3 to 4 feet (1 to 1.3 meters) apart, with other plants in between as mite roadblocks. Byrne says some large landscapers are not using roses because it’s too expensive to maintain them. Customers still want them but won’t pay to replace infected plants, said Joe Ketterer, with Ruppert Landscape of Laytonsville, Maryland, which works in six states and the District of Columbia. He said his company uses roses but prunes out affected branches, using hormones to stimulate growth in parts of the same plant without symptoms. At Tennessee-Knoxville, the University of Delaware and Oklahoma State, researchers lodge infected, mite-infested twigs in the foliage of healthy plants to see which stay well. “So far we have 20 roses that look good. This is their fourth year,” Windham said. But their test won’t be over until they’ve lasted a full four years without infection, he said.